I really love going out to eat in South Africa, and the options are endless. With one exception: Mexican food. If you come from America, this leaves you with a big hole in your life. We have kids who can never agree on anything, let alone which restaurant to pick when we go out (which isn’t often), but if I were to offer up “Mexican” as an option next time, I am convinced we’d experience instant agreement the likes of which we haven’t seen since Zax was one year old. I’ve heard talk about a Mexican restaurant somewhere in Joburg but I’ve forgotten where it is. I’m sure my readers will point it out to me, but I’m also sure it won’t be authentic, though I’d love to stand corrected. The closest I’ve come to Mexican was a quesadilla at Mugg & Bean, but let’s just say it was average, at best. What’s weird is that you can find the Old Paso brand taco mix and a variety of chips and salsa in the grocery stores here. So there must be some demand for Mexican food. It’s just that the actual Mexicans haven’t gotten the word yet. Which makes sense if you consider that they just have to walk across the border to get to the U.S., versus getting on a boat heading for South Africa. I guess if we were to look for a South African parallel we’d have to hope for a Zimbabwean equivalent to Mexican food, but I don’t think that has been invented yet. In the absence of any globetrotting Mexicans, I’m left to making my own chili. 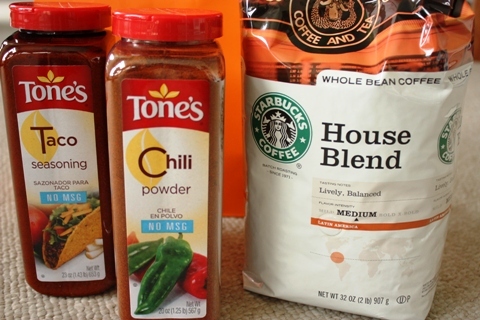 Which gets me to the point of this blog post – telling you where to find Mexican chili powder. Or rather, to get one of my readers to tell us, after I’ve claimed that it can’t be found. That usually works like a charm, like with my hunt for chocolate chips. But so far I haven’t had such luck with chili powder. Mention it to a South African, and he’ll invariably send you to an Indian store. But that’s not the right kind of chili powder, you see. I don’t want ground up chilies, I want the spice that goes into a Mexican chili, ground beef, tomatoes, beans and all. So who should come to the rescue tonight, as I was making chili and it just wouldn’t taste Mexican? A fellow blogger of course. Cooking with Corey is where I learned that you can make chili powder from stuff you typically have in your spice rack. It took me two minutes, the chili turned out great, and I now have a little container full of more chili powder for next time. 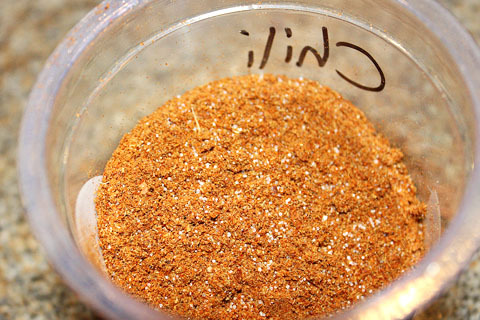 No more hunting for chili powder for this cook, if it’s that easy to make. Even Zax, who always hovers over the pot when I cook chili and begs, I mean BEGS, if he can add some more Gunpowder or Insanity sauce to it, was quite happy this time. Thank you Corey! When I see a picture like this, I automatically have to think of The Office, I think it’s Season 6, where Kevin brings a pot of chili to work. Have you seen that one? Where he drops the whole thing and then tries to rake the chili all back into the pot? 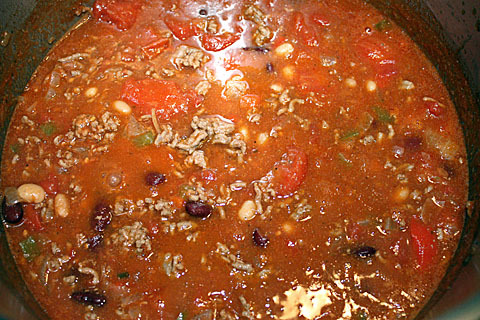 If you have, you may no longer be in the mood for chili, but just in case I’ve included the recipe at the end of this post. As luck would have it, a day after I wrote this post I received a gift from a newly arrived American expat (or, I should say, not so newly arrived, it was just their container which was newly arrived about three months after them) and what should I find in the gift bag next to an enormous bag of Starbucks beans? Two just as enormous spice jars, one with taco seasoning and the other with chili powder! Thank you Paige! Heat olive oil in a large pot (your largest) and saute the onions over low heat until soft. If you’ve got other vegetables, add them soon thereafter and saute together. Turn up the heat and add mince, breaking up any lumps as it browns. Add all the rest of the ingredients except for the beans, bring to boil, then turn down the heat and let simmer over low heat for about 20 minutes to half an hour. If it looks too dry, add some water. I like my chili quite soupy. I usually cut up the canned tomatoes with a scissors after dumping them in the pot, so that they come apart and don’t offend the members of my families who don’t like tomatoes (i.e. kids). Add the beans, simmer and stir for another 10 minutes or so, and that’s it. 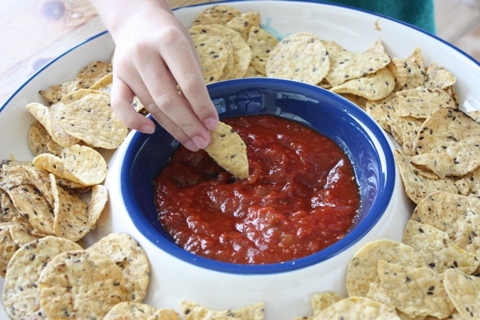 Serve with plenty of cheddar cheese and sour cream.